Uglyworld #1814 - Thwuuump! - (Project Cinko Time - Image 23-365), a photo by www.bazpics.com on Flickr. Cinko: "Awooooaaaa, whats the heller!" Cinko: "Awooooaaaa, what does you thinks you is doings Babo!" Babo: "Makerings funner of the new kidders on the blockers!" 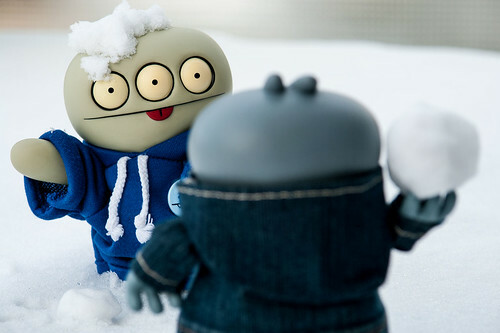 Cinko: "Beaters it Babo, I should be alloweds to enjoyers the snow!" Babo: "Yeah alrights, can I tell you one more things before I goes?" Cinko: "OK, but only one more things"
Cinko: "Awooooaaa, that one hurtereds!"